I have been negligent in my blogging duties. I have done some really cool trips recently that I have failed to share. I went mushing in Fairbanks and wore my Go Pro for the first time, and managed to film my crash – nice. I went to Minnesota and Seattle and saw the land of 10,000 rubber duckies. 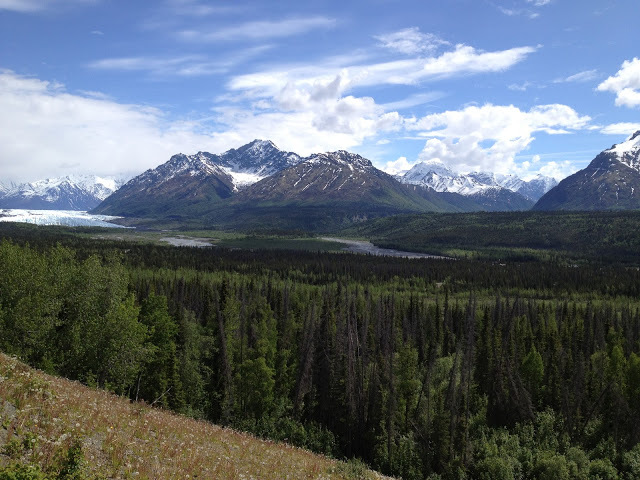 And last weekend I went to Talkeetna by way of the Burma road. I rode with a few new friends and had a blast. I did all of this and failed to share any of it on my blog. Perhaps they can serve as fillers for a slow time? But today, I headed North to the Klondike! 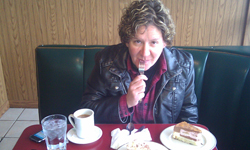 Jaz and I are back on the road doing a tour in our own backyard – The Klondike Loop. Our Klondike dreams are not inspired by the search for gold however. We are in search of Black Death. I have dreamed of Black Death since I first sipped this porter last year. The Russell Black Death Porter is a little higher in alcohol at 6.5%, with a blend of Canadian and Scottish malts. Problem is you can’t seem to get it in the US. So off to Canada for the death, eh? In addition to searching for death, this mini-epic trip rolls a touch of the Dust2Dawson into the mix – we will be in Dawson on Friday. We rolled out of Anchorage in the afternoon today with the sun shining and the tunes playing. 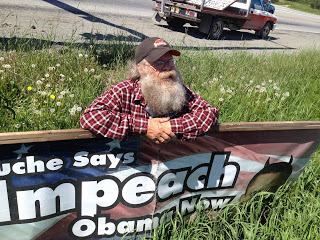 We pulled into Palmer, Alaska to the welcome of a single protester demanding Obama be impeached. We topped off our tanks and then went over and chatted the man up. He had some grand ideas on how to run the country. 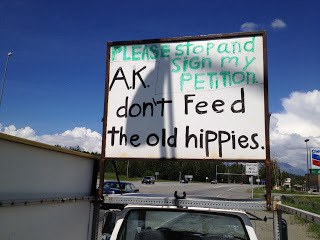 We praised him for his passion and signed his petition to run against Yon Dung, our only congressman. More power to him. The view coming into the Matanuska-Susitna Valley was spectacular and it was very tempting to try out the new zip-line by the Matanuska Glacier. We passed this time, but maybe on the way back. We spent a bit of time photographing the glacier. I discovered the first item I forgot to pack (this is Erin’s fault); the camera clip for the tripod. I brought the camera and the tripod, but without the clip I can’t use them together. *Sigh. * This means I’m packing around an unusable tripod for about 1600 miles. The weather turned ugly at Mount Eureka and we hunkered down for torrential rain all the way to Glennallen. We needed a break and food, but unfortunately, there is nowhere to eat in the City of God except the Caribou Hotel. Against our better judgement, we stopped. No sooner did our food arrive before we both realized what a stupid idea that was. We figured if the food didn’t kill us, the Christians would. I hope we sleep tonight! 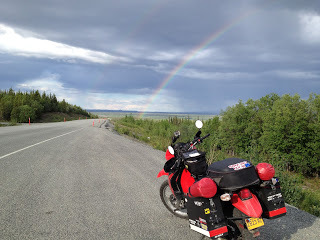 More rain to Gakona, then a nice rainbow popped out at the end of the ride. We are holed up in Chistochina. I’m going to go put an ice pack on my arm. After holding the handle bars all day, my arm is tender right at the place I broke it. Tomorrow we hope for a dryer road over the Top of the World Highway into Canada. Well, Jaz wants dryer roads. I like the mud! 🙂 Mud and rainbows, a good combo! I would be upset if I couldn't get my tripod and camera to play together nicely, but the pictures look pretty good, so it can't be all bad. I vote for backfilling slow times with previous undocumented trips. Did you break your arm on one of those??? Thanks for the photos! Great shot of the Matanuska Glacier.